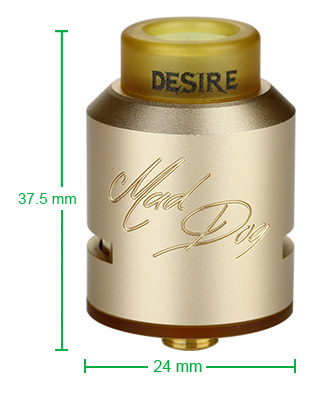 Desire Mad Dog RDA is a luxurious rebuildable dripper tank. It comes with double convex 2-post build decks, which is designed for clapton and fused coils. You can also use it with ordinary coils. And adjustable bottom side airflow will provide enough air during the vaping. And condensates won't be inhaled to your mouthpiece with the PEI drip tip. 7 colors. Click the button below to add the Desire Mad Dog RDA Kit to your wish list.